January 29, 2019 by Ecommerce News. About Launch with tags Europe. 2815 views. 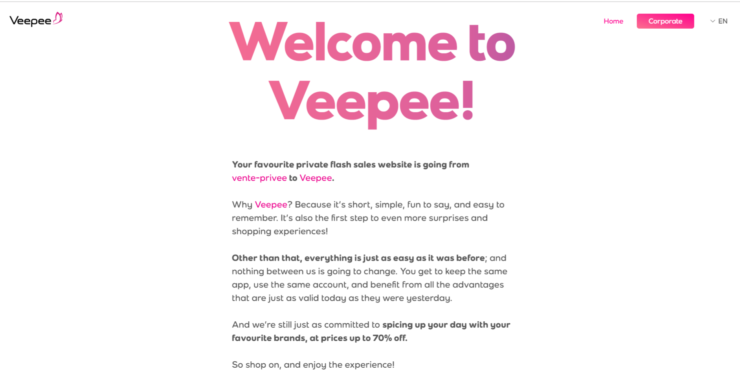 The popular French online shop Vente-Privee has merged with five other brands to form a new online store called Veepee. This new name will now be used in fourteen different countries in which Vente-Privee, Vente-Exclusive and the three other European brands are active. The Vente-Privee Group has consolidated its brands Privalia (active in Spain, Italy, Mexico and Brazil), Vente-Exclusive (Benelux), Designer & Friends (Denmark), Zlotewyprzedaze (Poland), Eboutic (Switzerland) and Vente-Privee (France and Germany) under one unified conglomerate called Veepee. According to the company, it’s a new chapter in the company’s European history. It has been quite the operation to transform the different brands and platforms into a one-stop online shop. It’s expected that the full integration process will be finished in spring next year. At the end, there will be a leading ecommerce player with a total turnover of 3.7 billion euros (tax included) in 2018 and a total of 72 million members.